The Blaze Fireman's 5K lets you run, walk or crawl 3.1 miles through the town of Manhattan. Participates will also relish in the opportunity to dash through mud and will come upon other exciting obstacles all while raising money for the Manhattan Volunteer Fire Department. Your entry fee includes a race day t-shirt, stainless steel race cup, bib, chip timing device, awards and door prizes. The race will commence at 10:00 A.M. Runners, joggers, and walkers are all welcome. The Manhattan Fire Department serves the Manhattan and outlying rural communities in a number of ways. It has a presence at the local schools through a scholarship program for graduating high school seniors and provides hands-on instruction and information for elementary students during fire prevention week. As part of the broader community, a benevolent fund is maintained to help individuals and families in times of crisis. In addition, MVFD helps support community activities that provide support in other ways. Examples include: supporting the Community Basket which provides food to families and supporting our local Santa to help bring gifts to Children during the Holidays. Emergency repsonse is the most recongized service of the MVFD. The 15 members train weekly and serve year round. There are many classes, equipment and material costs, as well as certifications involved in equipping its members to better serve the residents of our district. 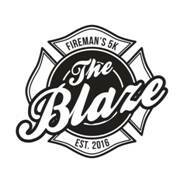 The Blaze Fireman's 5K is a fundraiser to continue and further the preparedness of the volunteers at MVFD. We want to Thank You for the consideration of this cause and we hope to see you June 8th!